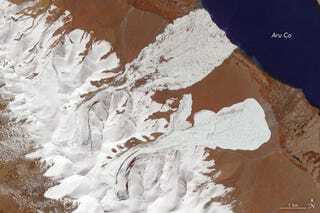 Over the summer, two enormous avalanches struck the Aru Glacier in Tibet back-to-back. Now, after several months of careful study, scientists think they’ve identified the cause of the first ice slide, which claimed the lives of nine nomadic herders. You’ll be shocked to hear it has to do with climate change. When over 70 million tons of ice broke off the Aru Glacier in the mountains of western Tibet on July 17th, it raised eyebrows in the glaciology community. After all, the collapse was totally unexpected and nearly instantaneous, burying 3.7 square miles of valley floor in a matter of minutes. But when another enormous ice slide occurred nearby two months later, jaws dropped to the floor. So, what the hell happened? When Gizmodo reported on the avalanches back in October, the working theory was that a process called ‘surging,’ in which ice flows from the top to the bottom of the glacier and causes it to advance more quickly, primed Aru for a sudden collapse. But a new study, led by researchers at the Chinese Academy of Sciences and Ohio State University, argues that the July 17th ice slide looks less like a case of glacial surging, and more like a case of way too much water seeping to the bottom of the glacier, causing it to detach from bedrock and slide downhill. How could so much meltwater have accumulated at the bottom of the Aru Glacier? Nobody’s certain, but Thompson and his colleagues are wagering that an unusually wet spring and long-term warming trends are to blame. Prior to the July avalanche, the nearby meteorological station of Nagri recorded its highest rainfall totals in the last six years. And average temperatures in this part of Tibet have risen rapidly, about 1.5 degrees Celsius (2.7 degrees Fahrenheit) over the past 50 years—although this past summer was relatively mild. 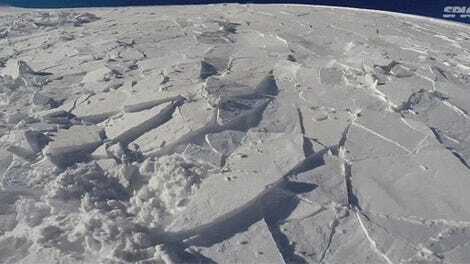 More work is needed to determine if the second avalanche, which occurred on September 24th, had a similar underlying cause. But suffice to say, the possibility that these two events are linked to each other, and to an emerging trend, is terrifying.